"The Roaring 20's ~ Transportation Beaches Style" Historic Black & white photos painted in living color. Each painting in this series has the color RED, as RED is the color of Love; it is through love that we experience the best in life. Walking is the best way for anyone to get around the beach! Here we have a joyful group of 12 people doing just that. 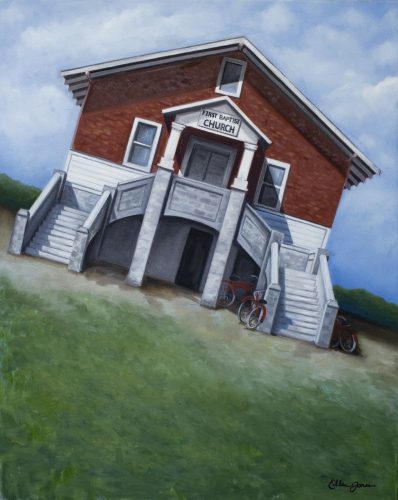 Iris Smith, Gertie Sebate, and Ellen Smith are some of the participants of this lively bunch. The women are especially excited as they were liberated from the lengthy, heavy bathing suits of days gone by. The rage was to wear the bright RED swim suits designed by Jantzen, who still makes swimming suits today. 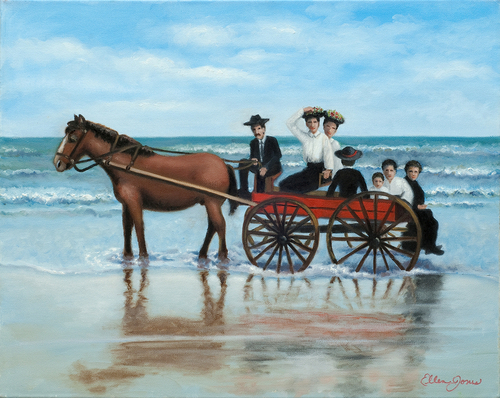 Mayor Henry Shockley and Ottillia Knauer Shockley were among the seven passengers enjoying a leisurely ride on the beach in a horse drawn RED wagon. It's a glorious day at the beach, as Louise Henson poses on the running boards of a Graham-Paige Roaster parked on the grounds of the Atlantic Beach Hotel. She is all dolled-up celebrating her 18th Birthday by wearing her snappy white dress with matching RED shoes. "The Roaring 20's ~ Transportation Beaches Style" Historic Black & white photo's painted in living color. 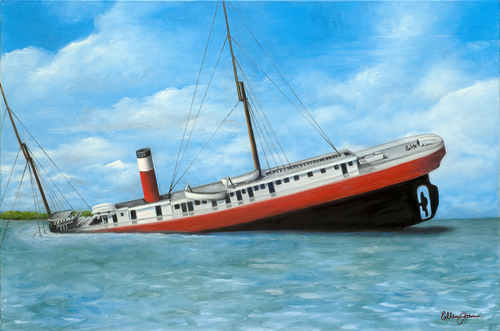 Each painting in this series has the color RED, as RED is the color of Love. It is through love that we experience the best in life; those are the moments we cherish forever." It's a fabulous day at Jacksonville Beach! 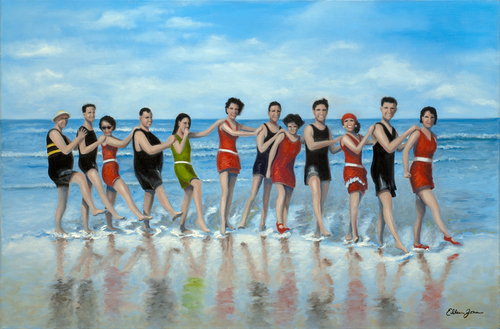 Multitudes of cars bring people wearing their best beach wear in colors of black, blue, RED, and green to enjoy swimming in the ocean. 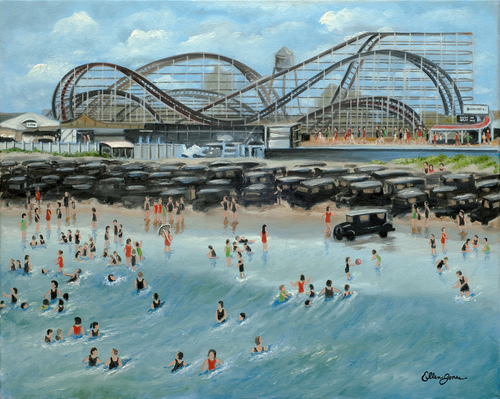 For the adventurous soul, a wild ride awaited them on The Beach Coaster. Standing 93 ft high, it could go as fast as 50 mph. There were three roller coasters that operated at this location between 1923 - 1950. 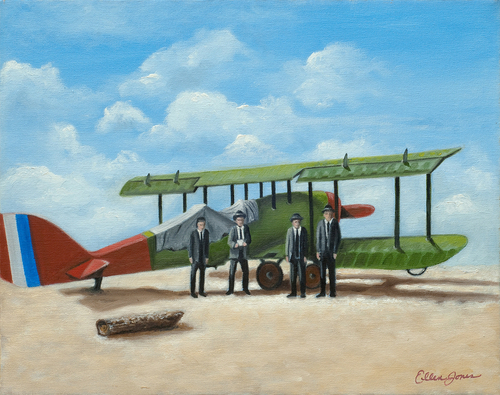 G. Newton, E. George, J. Perry and M. Thurber pose in front of the De Havilland DH-4B. The plane had the beautifully distinct markings of a RED propeller and tail. The new aircraft cost approximate $11,000. It was highly advanced in its day as it flew in record breaking time from San Diego, CA to Jacksonville FL in 22 hours and 27 minutes on Feb 24, 1921. Unfortunately, on its return flight one month later, the plane crashed in Crowley, Louisiana and killed its pilot, Lt. William Devoe Coney. The Roaring 20s ~ Transportation Beaches Style Historic Black & white photos painted in living color. Each painting in this series has the color RED, as RED is the color of Love; it is through love that we experience the best in life. And those are the moments we cherish forever. 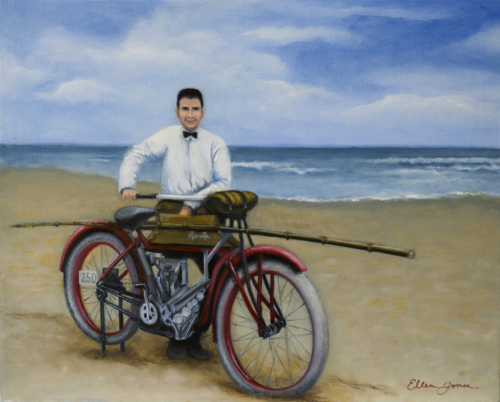 On his trusted RED motorcycle, this unidentified man is dressed and ready to spend a relaxing day surf fishing on the beach. Hopefully, bringing back an abundant catch of whiting and blue runners! 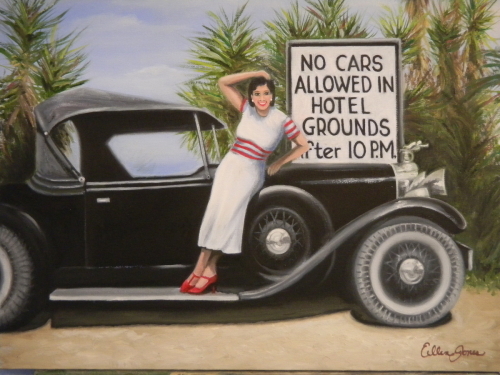 The Roaring 20s ~ Transportation Beaches Style Historic Black & white photos painted in living color. Each painting in this series has the color RED, as RED is the color of Love; it is through love that we experience the best in life. And those are the moments we cherish forever. This 1927 Chrysler Convertible was the Jacksonville Beaches Area Historical Society entry for the 1978 Welcome Day Parade. Mr. J.T. McCormick is driving the breezer with Mrs. Jean Haden McCormick in the passenger seat. 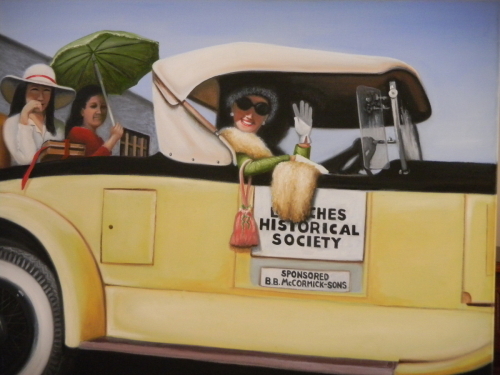 Riding in the rumble seat, wearing a bright RED sweater, is Mrs. Suzanne McCormick sitting next to Mrs. Patricia McCormick Wainer. 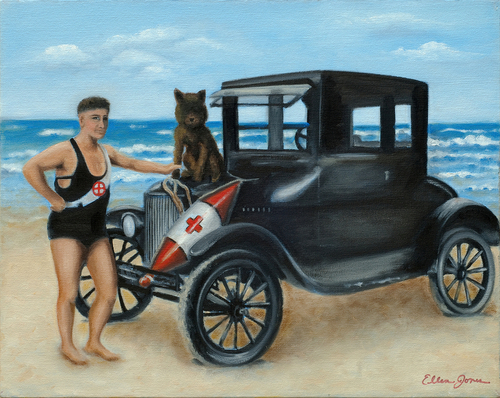 Ernest Porter takes a break from his life guard duties at Pablo Beach to pose for this picture with his loyal companion and his Ford Model T. He proudly displays the famous American RED Cross (A.R.C.) Life Saving Service patch on the sash across his swimming suit. Black & white photos painted in living color. was located on Mundy and 3rd St from 1922 - 1944.
but didn't want to leave the neighborhood. It doesnt get any better then this! 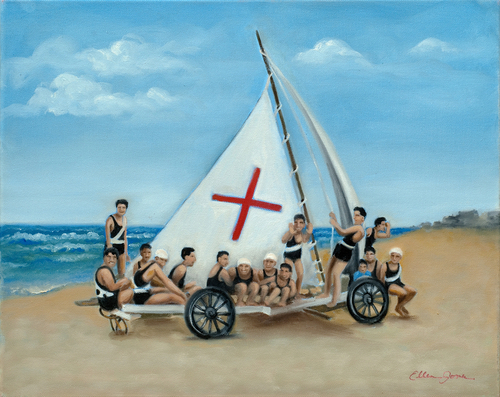 On this absolutely perfect day in 1929, fifteen lifeguards and friends enjoy the day riding on the "San Sailor"
RED lifeguard cross on the sail.